MEGA DUO combines generous proportions with aesthetic independence. The baths are made to be shared. Two identically formed backrests and the central waste make for optimal bathing comfort for two people, along with broad armrests on both sides of the bath. 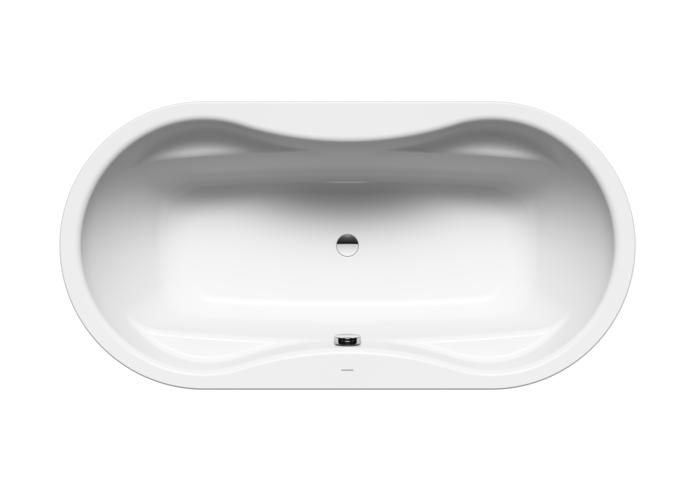 The curvy one-piece panel harmonises beautifully with the bath’s inner contours and allows for freestanding placement. Bathtubs may be supplied with pre-drilled mounting holes in the rim for taps or retractable shower hoses. The KALDEWEI sound insulation set BWS for bathtubs, in conjunction with KALDEWEI’s sound-insulated feet for bathtubs, provides optimum sound insulation far beyond the requirements of DIN 4109/A1. The German technical inspection association TÜV Rhineland has certified KALDEWEI's full anti-slip system as having anti-slip properties compliant with quality class B for wet barefoot areas (DIN 51097) and quality class R 10 for anti-slip characteristics in work spaces and working areas with an increased slip risk (DIN 51130). The set consists of one LED spotlight, a control unit with power cable and a pushbutton for spotlight operation in the bathtub.